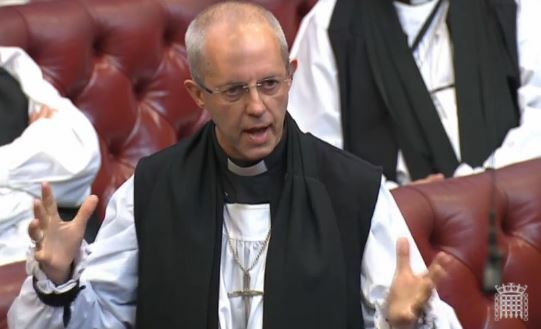 On 5th July 2016 the House of Lords debated a motion “That this House takes note of the outcome of the European Union referendum.” The Archbishop of Canterbury, Most Revd & Rt Hon Justin Welby, spoke in the debate. His speech is below in full, followed by extracts from the speeches of other Peers. The Archbishop of Canterbury: My Lords, the events of the past two weeks have led to some of the most traumatic and dynamic changes that we have known. The course of the campaign was robust—as it properly should be on such great issues—but at times veered over the line on both sides: it was not merely robust but unacceptable. Through such comments were created cracks in the thin crust of the politeness and tolerance of our society, through which, since the referendum, we have seen an outwelling of poison and hatred that I cannot remember in this country for very many years. It is essential, not only for this House but for the leaders of both sides and throughout our society, to challenge the attacks, xenophobia and racism that seem to have been felt acceptable, at least for a while. “Love one another, cease to tear at one another, lest at the end you consume one another”. We are in danger of doing that in the way that our politics is developing at the moment. If we are to tackle that, we have to put in place some fundamental issues to be capable of creating the agile, flexible, creative, entrepreneurial and exciting society—full of the common good and of solidarity and love for one another—which is the only way that this country will flourish and prosper for all its citizens in the world outside the European Union of the future. The biggest challenge we face if we are to be effective in creating a new vision for Britain, a vision that enables hope and reconciliation to begin to flower, is to tackle inequality. It is inequality that thins out the crust of our society and raises the levels of anger, resentment and bitterness. We have done it before; this is not new. In the 19th century we tackled inequality. In the great Governments following 1945 we tackled the inequality that had been so ruinous to our society in the 1930s and led to the failures of that time. The tools for tackling inequality are as readily available as ever. They are the obvious ones of education, public health—we would add today mental health—and housing. We must, however, take up those tools and invest in them. I am glad that the education side of the Church of England, which I believe my right reverend friend the Bishop of Ely will speak about later, has just launched a fresh vision for education that draws together not only the need for skills but the need for a whole person, deeply imbued with the virtues, hopes and aspirations that we will need in our society. However, we also need investment in public health and to narrow the inequality gaps that have emerged in recent years. Last week we saw horrifying figures on the levels of child poverty in this country. We have seen a widening of the unfairness in our society, and with that it is no surprise that some shocking things have emerged in the last few days. Those tools, however, cannot be used effectively if they are held in some kind of vacuum of values. We need a deep renewal of our values in this country. We need a renewal of a commitment to the common good and of solidarity. We need a sense of generosity, hospitality and gratuity, of the overflowing of the riches and flourishing that we possess, not only into our society but across the world. The issues of immigration and the hatred expressed to those who may have been here for two or three generations, are not to be solved by simply pulling up the drawbridge. Neither will the plight of the many British citizens in Europe. This morning I was talking to the Bishop in Europe, whose churches many of them have attended, and hearing of their massive concern and deep insecurity. I am so glad that the noble Baroness, Lady Smith, the noble and learned Lord, Lord Wallace, and the Lord Privy Seal have all been clear about the unacceptability of treating people as bargaining chips. I add my voice to that. “The eternal God is your refuge, and underneath are the everlasting arms”. We live in a society deeply embedded in that sense of destiny and of hope. We can catch hold of that hope and be that agile, flourishing and entrepreneurial society that will benefit the poorest and richest—one that will reach out with a forward foreign policy to the poorest around the world and can renew the standards that we believe are the best of this country. I hope that in this debate we will have that sense of optimism and hope. 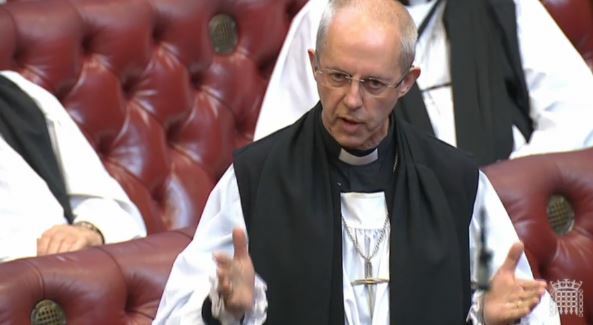 Lord Radice (Lab): We have just heard a wonderful speech from the most reverent Primate the Archbishop of Canterbury. We need to draw important lessons from what happened in that campaign. We all need to act with a certain amount of humility. Baroness Goldie (Con): The future is about the new journey which we have been mandated to embark upon, trying to heal and unite as we travel, moving forward with purpose, focus, energy and hope, about which the most reverend Primate the Archbishop of Canterbury spoke so eloquently and percipiently. Lord Whitty (Lab): The elite are not listening to what is going on in large parts of our country. The most reverend Primate the Archbishop of Canterbury had it right today. The issues that people were really moved by were their employment prospects, their lack of access to public services and inequality in our nation. Lord Lamont of Lerwick (Con): I agree with the most reverend Primate the Archbishop of Canterbury and the noble Baroness, Lady Smith; I do not believe the status of EU nationals residing in this country and working in this country ought to be a bargaining chip in the negotiations at all. That ought to have been cleared up already. I also agree with the most reverend Primate, the noble Baroness and others, who have very forthrightly condemned the attacks on Polish and other immigrant communities. This is totally unacceptable and must be roundly condemned. Lord Giddens (Lab): I therefore wholly echo the sentiments mentioned in the wonderful speech of the most reverend Primate the Archbishop of Canterbury and all the other speakers, including the noble Lord, Lord Lawson, on this issue. There is a huge repair job to do here for all of us and this House can take the lead in some of it. Lord Kerr of Kinlochard (CB): I like the noble Lord, Lord Giddens, I pay tribute to the remarkable speech of the right reverend Primate the Archbishop of Canterbury. I cannot match it and therefore will be more mundane in making six points about Article 50. Lord Lloyd-Webber (Con): This is undoubtedly a time of great uncertainty for our country. The issues being discussed are of immense importance, particularly those so eloquently raised by the most reverend Primate the Archbishop of Canterbury earlier in this debate. Baroness Mobarik (Con): My Lords, one word stands out in reference to the recent EU referendum: “division”. The most reverend Primate the Archbishop and many noble Lords have stated this today. Lord Cashman (Lab): The most reverend Primate the Archbishop of Canterbury understood well that we must now come together as a nation. I suggest that that should not rule out the prospect of a Government of national unity. The most reverend Primate recognised clearly that inequality is at the very root of the disfranchisement and disempowerment felt by so many. We need to catch hold of that hope he spoke of, not abandon it, and find the means to celebrate difference and diversity as fundamental values of our country—an inclusive and outward-looking country. In the meantime, the comedians are leaving the stage and the tragedy continues to unfold. Baroness Walmsley (LD): I find it very difficult to obey the exhortation of the most reverend Primate the Archbishop of Canterbury in his excellent speech to be hopeful and positive. The only thing that gives me hope is the ability of the NHS and care staff to keep calm and carry on in the interests of their patients, despite the turbulent waters into which we have been steered by the man without a plan. Lord Tugendhat (Con): As the most reverend Primate the Archbishop so eloquently pointed out, the place we should start is to prevent the sort of views that Ms Le Pen and Mr Wilders and, indeed, Donald Trump, advocate….I of course welcome what has been said in this debate about not using EU citizens as hostages or bargaining counters. That is quite right. However, a great deal more is needed and the most reverend Primate the Archbishop set us all an example. Lord Kakkar (CB): We must also use this as an opportunity to engage once again with our national values. At the heart of those national values, as we heard earlier from the most reverend Primate the Archbishop of Canterbury, are tolerance and decency. Lord Griffiths of Fforestfach (Con): For myself, I feel that the vote touched a deeper nerve in our society—something commented on by the right reverend Primate the Archbishop of Canterbury. The vote was a judgment by people about the way that British society has developed over the past few decades. Lord St John of Bletso (CB): I share the concerns of many of your Lordships—especially those of the most reverend Primate the Archbishop of Canterbury, who made a most moving speech—about the need to stand united to counter threats of xenophobic behaviour and hate crimes. Viscount Trenchard (Con): I agree with the most reverend Primate the Archbishop of Canterbury, my noble friends Lord Lawson and Lord Lamont and others that the Government should give immediate and clear assurances about the endurance and permanence of the rights of residence of the citizens of other EU states who are living here and who have made this country their home. Lord Hylton (CB): We should reject stereotypes and work to understand each other, both at home and abroad. The most reverend Primate the Archbishop of Canterbury struck just the right note in calling for new vision and old values. We must surely rise to the occasion. Lord Howell of Guildford (Con): …bridges between the overwealthy and those who feel left out—bridges which some of us have been arguing for four decades should be built through wider capital ownership and new forms of sharing capital. That is how we can meet the concern of too much inequality, as the most reverend Primate the Archbishop of Canterbury rightly spoke about yesterday, although too little wealth creation is part of the same problem. Lord McKenzie of Luton (Lab): As the most reverend Primate the Archbishop of Canterbury told us yesterday, the referendum has shown in the starkest terms that we are a divided country. Mending it should be our highest priority. Baroness Northover (LD): My Lords, we have had some amazing speeches during the last couple of days. The most reverend Primate the Archbishop of Canterbury was especially profound and moving. Lord Lisvane (CB): My Lords, we have heard some outstanding speeches in this debate. The contributions of the Leader of the Opposition, of the noble and learned Lord, Lord Wallace of Tankerness, and of the most reverend Primate the Archbishop of Canterbury were compelling and memorable. Together, they expressed a sense of shock, of lost opportunity and of the need to heal wounds. Lord Cavendish of Furness (Con): we are indebted to the most reverend Primate the Archbishop of Canterbury for an immensely powerful speech. It is for all of us to reflect long and hard on an intervention which redeemed an otherwise rather sad day. 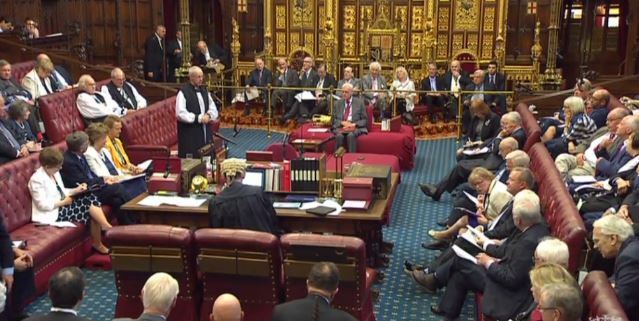 Baroness O’Loan (CB): We have heard many calls over the past two days for the exercise of power for the common good, perhaps most strongly in the words spoken by the most reverend Primate the Archbishop of Canterbury in this Chamber yesterday. Baroness Smith of Newnham (LD): One of the things that was most poignant in the contributions from the most reverend Primate the Archbishop of Canterbury and from my noble friends Lord Dholakia and Lady Manzoor as well as the noble Baroness, Lady Mobarik, is that we seem to have lost our country and we are hearing things that are not worthy of the United Kingdom. That has to change. Lord Collins of Highbury (Lab) [frontbench]: The most reverend Primate the Archbishop of Canterbury rightly focused on the need for a new vision—a “new vision for Britain” that tackles inequality and enables hope and reconciliation. I agree. That is the way forward. I beg to move. House adjourned at 10.16 pm.